Operational: Routine day-to-day decisions. Usually made by lower-level managers. Low-risk. Tactical: Regular and short-term decisions. Made by middle management. Medium-risk. Strategic: High-level long-term decisions that give direction to the business. High-risk. A decision-making framework shows how different decisions are made. This Keynote outlines the main types. Considers forces both for and against the decision. The forces are weighted according to their relative importance and an overall ‘score’ for both views is produced leading to a quantified and objective decision. Looks at the contributing factors that have led to a problem or issue facing a business. This tutorial link provides useful guidance on how to conduct Fishbone analysis. 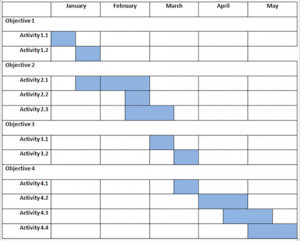 This link shows you how to create a Gantt chart using data in Excel.